The Keys To Success Achievement! When you do something often enough that you continue to do it without thinking about it, it becomes a habit. Vince Lombardi made winning a habit as he led the Green Bay Packers to the most successful playoff record of all time. "What It Takes to be #1" is a famous poster written by the great coach that still hangs on many office walls despite more than 40 years having passed since the legend stalked the sidelines. Unfortunately, negative thinking is a habit most people already possess. Positive thinking is also a habit that you might need a success achievement coach to help you develop. As a certified success achievement coach, I help people set and achieve their goals. In order to do so, I first need to provide the direction necessary for people to determine who they are and what they want. Most people, unfortunately, think my role is meaningless because they believe the entire answer to "who you are" is supplied by stating your name…And "what do you want" is most often responded to by simply stating an immediate, insignificant desire, like "I want to borrow a cup of sugar." That's why I'm not interested in attempting to work with "most" people. Successful people look at the world in a different light from the masses. They possess a burning desire to win or to achieve. One of their secrets is that they REALLY understand exactly who they are, who they want to be, and what they want to achieve. Their vision and thought patterns take on habits that set them apart. But anyone can adopt these patterns provided that they possess determination, the right methodology, the right attitude, and the right help. If you still think "who you are and what do you want" are insignificant questions, I cannot help you. But, if you truly want to get "better" in any and/or all facets of your life, and want to learn about the science of success achievement, please read further. My specialty is working with CEO's, but the same principles apply to virtually everyone….Because we'll all need to act as CEO's in some capacity as we go through life. Incidentally, "Who Are You, Really, and What Do You Want" happens to be the title of an outstanding book by Dr. Shad Helmstetter, founder of the Life/Coach Institute that issued my certification. I also am certified by the Master Mind Alliance International, an outstanding organization that has been in the success achievement and people building business since 1970, conducting personal growth, leadership training, and success achievement workshops. 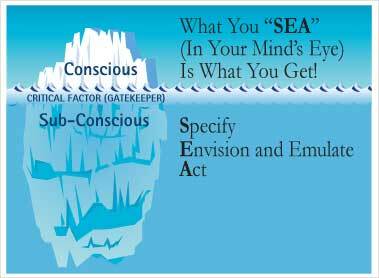 My overall methodology revolves around the slogan…"What you sea (S-E-A) in your mind's eye, is what you get. Picture an iceberg…The 5-10% of the object that is above the water is the only part that most people see. This part of the iceberg is representative of our conscious minds. But what you CANNOT see is always more powerful than anything you can see. In the case of the iceberg, the invisible portion is the very foundation of the entire object, and this serves as an excellent representation of our subconscious minds. It is within our subconscious minds where habits reside and the foundation for all of our future achievements is stored. The subconscious mind does all this while simultaneously performing mundane tasks such as making our hearts beat and forcing us to breathe. In order to achieve your true potential, you need to learn to sea (S-E-A) things through your entire mind's eye (the conscious, as well as the subconscious). A - Act. Start taking action steps that lead you down the path toward getting where you want to end up. If your office computer utilizes flawed software, do you "will" it to be fixed? Of course not. You either buy other software or call in a programmer to re-program the software that you have. Our subconscious minds have permanently recorded everything we've ever heard, seen, or experienced….right or wrong…..That's how we were, and are programmed. Is our programming important? Well let's examine the acronym T-F-A-R… Our programming leads to our thoughts (as well as beliefs and attitudes) represented by the letter "T". Our thoughts create our feelings (F); which lead to our actions (A); which lead to our results (R); which, in turn, reinforce our programming. Abiding by the law of repetition, what you've heard most, right or wrong, is dominant over what you've heard least. That means the recollection of a phrase such as "what's wrong with you" will tend to stifle you from presenting any new ideas. By the time we are 18 years of age, we've heard what we CANNOT do approximately 148,000 times…As opposed to what we CAN do, only a few hundred times. As a result, about 77% of what we tell ourselves is negative. Negative programming produces negative results. Do you think you don't have conversations with yourself? Research states that we talk to ourselves 50,000-60,000 times per day. And just as in the case with your office computer, you cannot "will" yourself into more positive programs. But you can put the law of repetition to work in your favor by listening to positive pre-recorded affirmations on a regular basis. That's what our positive programming through self talk CDs is all about. I believe Henry Ford was the first person to state "whether you think you can, or you cannot…either way you are right." This slogan is the basis for the law of intention…ie…What you think about you bring about. Most people never achieve what they want…primarily because most people never really know what they want. That's because 80% of people never set goals for themselves. And 70% of the 20% of people who do set goals, fail to achieve them. That leaves us with only approximately 6% of our population that achieves any goals, at all. And the vast majority of these goals are small and easily attainable. We have developed a formula for active goal setting and tracking that will allow you to surpass not only the 94% who fail to achieve their goals, but the top 6% who actually do experience some success in their goal setting endeavors. To far too many of us, the word "help" is a four letter word. But it is very difficult for us as individuals to objectively analyze who we are, and achieve what we want? Who's going to hold us accountable, expose us to best practices, keep us focused, on track, and continuously sharpen our saw? Have you ever had someone focus entirely on you - to help you get what you really want? That's the role of a certified success achievement coach. I can help you make yourself "better" in every phase of your life. I can tie all the pieces together to increase the odds that what you S-E-A, in your mind's eye, will become what you get. "Analyze the record of any person who has accumulated a great fortune, and many of those who have accumulated modest fortunes, and you will find that they have either consciously or unconsciously employed the Master Mind Principle." "No individual may have great power without availing him or herself of the Master Mind." "Economic advantages may be created by people who surround themselves with the advice, counsel, and personal cooperation of a group of people who are willing to lend them wholehearted aid in a spirit of perfect harmony." "No two minds ever come together without thereby creating a third, invisible, intangible force which may be likened to a third mind." The benefits of participation in appropriate, well monitored Master Mind Peer Groups are difficult to explain or describe. However, the experience is incredibly beneficial to all participants. I put together and oversee such groups, and I encourage you to consider exploring your own participation. For further information email barry@barrysea.com or call 713-822-5011.